Germany supports the upgrade of MTC’s library by funding the procurement of more than 140 books, worth 14,500 AUD. 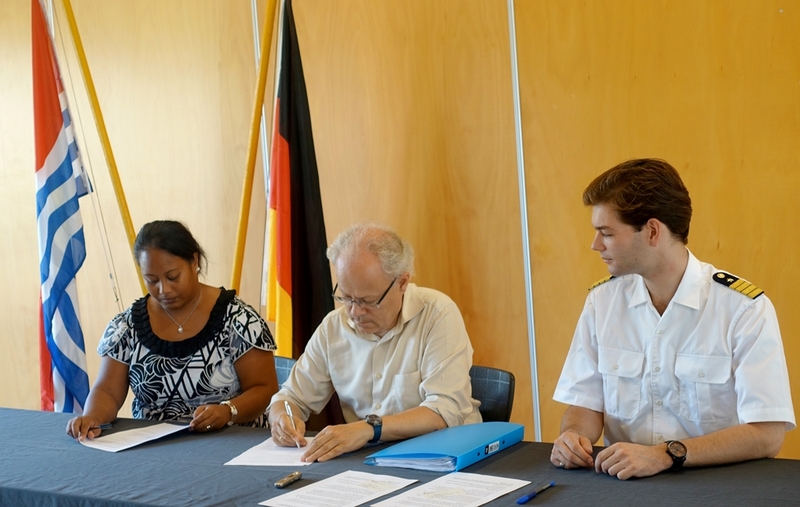 Gerhard Thiedemann, German ambassador to Kiribati, Bwakura Metutera Timeon, Secretary of the Ministry of Labour, and Malte Pertiet, Captain Superintendent of MTC, signed the funding agreement on behalf of their governments on 16 May 2017 at MTC. Gerhard Thiedemann emphasized that this project reflects both the long-standing diplomatic relations between Germany and Kiribati and the long-standing employment of I-Kiribati on German merchant ships. Bwakura Metutera Timeon expressed her gratitude on behalf on the Government of Kiribati. The Kiribati national newspaper Uekera reported in its issue 20/2017 from 18 May 2017 about the signing.